Everyone that knows me, knows that I am NOT a Do-It-Yourself enthusiast. Not at all. But on the other hand, I will never deny the importance of the DIY "movement" to the advancement of the arts and the sciences. If it wasn't for those crazy DIY guys and gals of the world we could not learn from mistakes and move forward. This is what this posting is about. Last weekend we went to the Keys, specifically to Islamorada, where we found out is the "Florida Keys History of Diving Museum". Located in a corner, from outside looks like a small place but once you are inside you realize that is not so small and that they have done a great job with the space they got. This Museum is a "must see". They have managed to have a great quantity of material but what is more important, they also have very good quality, with originals and unexpected things like a completely articulated puppet of a diver with a perfect replica of a real diving suit and, as you can see here, a complete collection of homemade diving devices (some of them will remind you of Tinman from Oz or about Bender in Futurama). With 12 different rooms dedicated to different aspects of diving, it also has space for the entertainment side of it: one room is about Verne's 20,000 Leagues under the Sea, with poster et al. You really don't need to be a diving fan to enjoy a visit to this place. If you like history or science or you used to love Cousteau series, this is a place you really want to visit. You'll love it! Their exact address is: 82990 Overseas Highway at MM 83, Islamorada, FL. 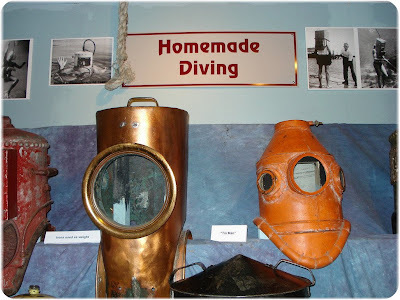 Their website is www.divingmuseum.com and you will not regret the visit!